I stumbled across this on another bloggers site. 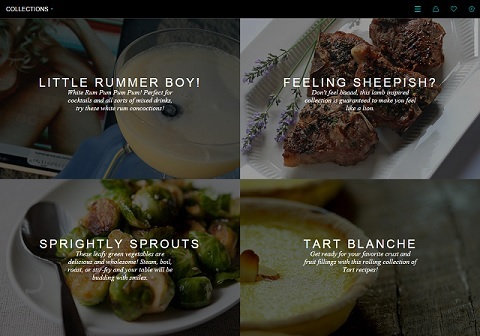 Gojee is a food and drink site that helps bloggers. The basic idea is that they aggregate recipes from various contributing bloggers and display them in an easily searchable format. Some initial impressions. I couldn’t get the sign up using facebook or google to work and had to create a new login. Not a great first impression as I hate creating new logins for things when existing ones will do. The drinks side of the site is very pretty. The whole screen is devoted to the photos of the drink with minimal controls around the top and sides to let you delve into things more fully. Since many bloggers do their own photography you can see some very lovely shots of drinks just scrolling through. The controls are responsive but somewhat poorly laid out. If you open the ingredients list you lose the ability to scroll to the right via mouse. Keyboard scrolling still works using arrow keys but that isn’t really stated, so I had to spend a minute figuring it out. Once you find a drink you like you can click on the ingredients and get a very scrubbed list of what is in the drink. It appears that unless you list something by name it will substitute the generic option. So suggesting Buffalo Trace as your favored bourbon for a cocktail might not carry over but listing Hendrick’s Gin would carry over. This could result in some AND/NOT OR search problems where looking for one filters out the other entirely. The lack of some ingredients may have more to do with the source of the recipes than anything else. Each of these is contributed by individual bloggers and not from some kind of central drink database. So there could be a plethora of martinis and daquiris but some rarer drinks may fall by the wayside. Once you have a look at what the drink has in general, you can add missing ingredients to a shopping list, or click on the full recipe at which point you are directed to the original blog post. This is a nice touch and a neat way to drive traffic to bloggers with good ideas and good photos. The site also allows you to make a list of things you already have, and things you would like to avoid so that it can actively filter things. They even let you dislike alcohol which lets you see kid friendly cocktails and sodas. There is a favorite items list on the site and it has a full range of social media sharing buttons which makes it easy to compile your own cocktail menu. I applied to be one of their contributors but their submission process didn’t leave me with a lot of information. I will update if I hear back from them later. I see a lot of duplication on the site, Just poking around in gin cocktails I found “The Income Tax Cocktail” and “Income Tax”. A classic from “Vintage Spirits and Forgotten Cocktails”, having it show up twice under slightly different names means that a lot of the recipes here could simply be variants on each other. I’m not sure how many super glossy photos of a basic martini we need but I know there aren’t that many ways to make it differently. Final thought, Come for the photos, leave for the blogs themselves. Posted in Around the Web, Tech.Tagged aggregator, blogging, gojee, website.